SAP UI5 is the development tool from SAP toolkit. It has various features to improve the user experience to create apps with rich user interfaces for Web business applications. 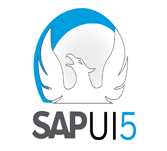 SAP UI5 tutorial discusses about the architecture, various key concepts, and important components of SAP UI5. SAP UI5 tutorial is designed for the candidate who want to learn the basics of SAP UI5, especially those who are involved in creating business applications. If you have basic experience of SAP module can help you to learn easily.